The colour is much a richer jewel tone than in this picture. Of course, I could not simply follow one or even two patterns without a bit of adapting. 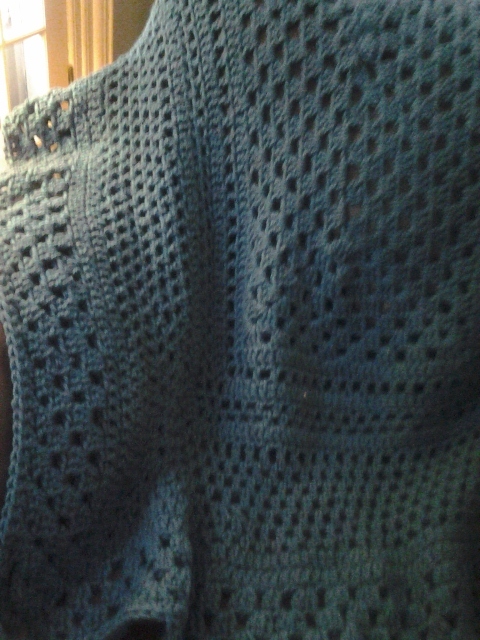 Rather than crochet a square, I added a few more shells along the side to form a rectangle. the same shape as a bed. Then, I added rows of chain one, skip one and also a few rows of solid double crochet, simply to add variety to the throw. The result has a lighter look than simply an ordinary granny square. And of course, once again this project is EASY. I used an I or 9mm hook and thick yarn so this worked up very quickly.